Shopkins are super cute, fun, small characters that live in a big shopping world! Over 140 different Shopkins brought to life per series as the cutest collectible characters! Does your little girl love Shopkins? If so, this bouncy castle is a real gem, a real treat and one that your darling is going to love! Girls Day Out! 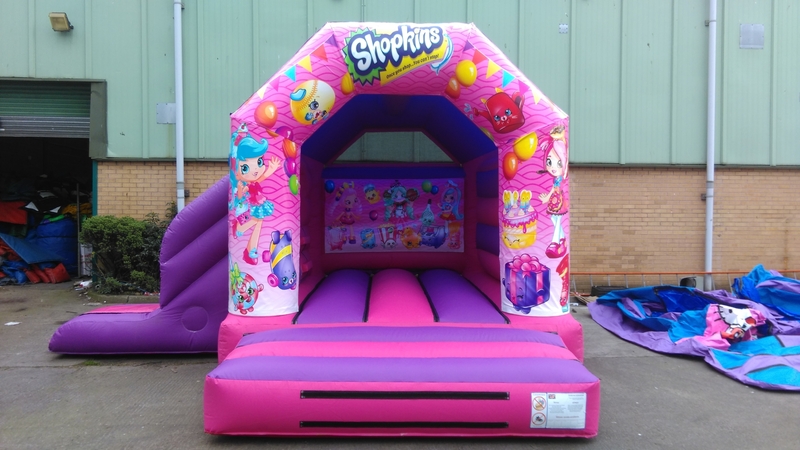 There's fun for all on our Shopkins bouncy castle with slide! Feed your passion for style and fashion, then take a bounce on a castle and take a trip on the slide with your party friends! At just £65, the price includes delivery, set up, inflation and collection as well as all the necessary equipment to make it a fun day. Just give us a call or send us an email, or even use our contact form. Of course, for delivery at home, do make sure to remove all the garden items such as patio furniture, swing sets and the like, so we can set up everything without unnecessary delay.